Intel: CPUs with integrated AMD-GPUs planned? Intel: No future for Iris Pro? According to rumors, Intel plans a turnaround in the GPU-space: For years, Intel tried to compete with Nvidia and AMD for the mid-range Gaming market, with its Iris-Pro-GPUs. Now it seems that Intel might want to work with AMD to put an AMD GPU into an Intel processor. Intel brought its Iris GPUs to the market with big ambitions in mind. The CPU-giant wanted to take Nvidia and AMD head-on with the powerful Iris Pro GPUs. A few years later it is certain: Intel did not succeed. The company dominates the GPU-market when it comes to the market share, because most business- and office-PCs are equipped with low-end iGPUs like the Intel HD 620. But Intel did not manage to win in the lower-end Gaming market at all, the Iris and Iris Pro GPUs were and are barely used by manufacturers. The first consequences of this failure were hinted at last year in leaked CPU roadmaps, which lacked the most powerful Iris Pro GPUs. The newest rumors give this story a completely different twist: Intel might be planning to cooperate with AMD, its old arch-nemesis. The biggest CPU manufacturer might license AMD GPU technology and develop CPUs with integrated AMD GPUs. The first CPU based on this cooperation is supposed to come out before the end of this year and be based on Kaby Lake. 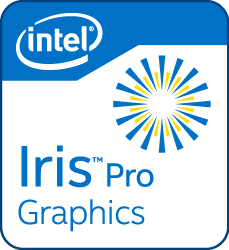 This would mean that Intel is giving up on Iris Pro. Until further details are being released, this to be considered a rumor of course. > Notebook / Laptop Reviews and News > News > News Archive > Newsarchive 2017 02 > Intel: CPUs with integrated AMD-GPUs planned?